My daughter received this as a gift years ago and loved it. No only did it teach her how to coordinate her shapes but it also teaches them eye hand coordination, such as how to open the door. There is a light switch that will teach them how to turn off and on lights. The sun and moon dial is interactive and when you turn it, it will say whether it is night or day, teaching them how to differentiate between the two. There is a window that when it is opened or closed it will say so: which also teaches your child the difference between the two. On the other side there is a mailbox which is also interactive and it also teaches the process of opening and closing the mailbox as well as how to put the mail in the mailbox. On the side there is a little gutter to where you can drop the ball in and it will spit out at the bottom. Again this also teaches eye and hand coordination. I would recommend this to any parent of toddlers. My child is four now and has a younger sister and they still play with this thing. My children received this toy with they were just under a year old. Even two years later, they still love to play with the Fisher Price Learning Home. There are a variety of activities that allow multiple children to play at the same time. There are several songs that play with catchy tunes that teach numbers, colors and letters. The children loved to open the door and climb through over and over again. The accessories that come with the house add so much play value to the Learning Home. If necessary, you can purchase replacement parts directly from Fisher Price. One thing I love about Fisher Price is the durability of their toys. This is no exception. 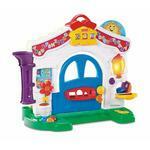 The house is very sturdy and allowed my children to pull up on it as they were learning to stand and walk. I would highly recommend this toy for babies who are just sitting up all the way through children who are walking and talking. It's just so much fun! This house is fun for all ages. My child has had it since they were little. Now he is 3 years old and he still won't let me get rid of it! He truly plays with it everyday. It's great for imagination play, not to mention it teaches them time, shape sorting, has a fun mailbox, and a ton of fun sounds and songs! Kids seem to really enjoy the doorbell, sliding window, and being able to crawl through the door. This was one of the best toys we purchased. Let's start with my personal favorite the light switch and door bell. Very cool! There is a clock at the top center. Helps with counting. They have a circle that has the sun on one side and the moon on the other. My child would spin that over and over. One of his favorites was the flower petal, he would spin it just like the wheel. He also loved the radio, it has four songs on it. It's super cute and the songs are catchy! You'll find yourself singing to them! There is a window that slides up and down. One of the coolest features is at the side the you can slide the ball into and it drop but it counts the ball. There is a mailbox with plastic "mail" that you can put into the box. I would pretend to write a letter and put in there and he would pretend to read the letter. It was quite adorable! Here is the best thing, it has been about 3-4 years and the original batteries it came with, still work! I was dreading changing them because they take a bunch of batteries but I've NEVER had to replace them. "It's bumper to bumper on the rainbow bridge..."
Great toy for hours of fun! My son got this for Christmas when he was 6 months old and has been using this for two years now. He loves this house! It's great because as he got older, he could do more with it, but even as a 6 month old he enjoyed opening and closing the door, window and mailbox. So it works for a variety of developmental stages. It takes up a bit of space, but it's a great toy! One of the best toys ever! 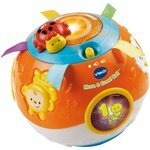 I have been really happy with most of the Fisher Price Laugh & Learn toys. This is by far, the best one though. Though this toy is fading and becoming more and more difficult to find, it is well worth the price you are going to pay. It is a very durable and very well made product. And it has lots to do for your little one. This toy is extremely educational, as it teaches a number of things. It has sing-a-long songs (one being the alphabet to teach letters), your child can drop balls in rain spout to learn counting, you can spin the house numbers and move dials on the clock, it also teaches opposites such as up & down, on & off, open & close, day & nights, and there is a shape sorter on the door to learn shapes and colors. Like I said, it's a very educational toy that provides lots of entertainment for your child. The music is not so annoying either, which is a huge bonus. Now, I don't know if they still offer this, but the Fisher Price website used to offer a replacement package for this product. It wasn't that expensive, but it is basically all the smaller parts of the product. You can order them, if you end up losing pieces some where down the line. Which with children, it is quite common. I really liked that they offered that. I would definitely recommend this toy over any other toy on the market! My children both love this toy and they are almost 3 years apart. My oldest still loves to play with it with his little brother. My oldest got the toy at first when he was only six months old and when I opened up the window and the dog started barking, he started laughing. The door opens and closes. it comes with shapes. There are numbers on the top that spin. It has a radio that plays music, plays songs. There is a place for a ball to go on the side where the purple is and my children love it when you put a ball down the purple tube and the house plays, "Itsy Bitsy Spider." There is a mailbox with mail and a key for the door that you can turn. There is also a light that you can turn on and off with an actual light that turns on and off when the children flip the switch. There is also a sun/moon that turns on the top of the house. Of all of the Fisher Price toys, this is probably a favorite. I bought this for my son for his first birthday. I was a little hesitant to spend so much money on one toy, but so glad I did. He loves it and play with it a lot. It teaches letters, numbers, opposites, and shapes. It sings, talks, lights up and is a lot of fun. When ever we have kids over they always want to play with it. Great toy. 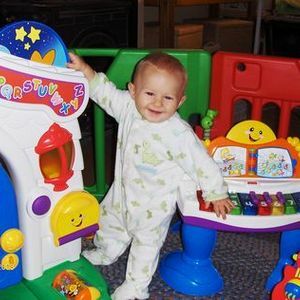 We purchased the fisher-price laugh and learn learning home for our first child. He loved it, especially all the songs from the radio. 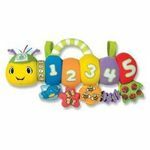 It provides many learning opportunities - counting, colours, telling the time, open and closed, shapes, on and off etc... It is now being played with by our third child and still going strong. Big thumbs up from our family.